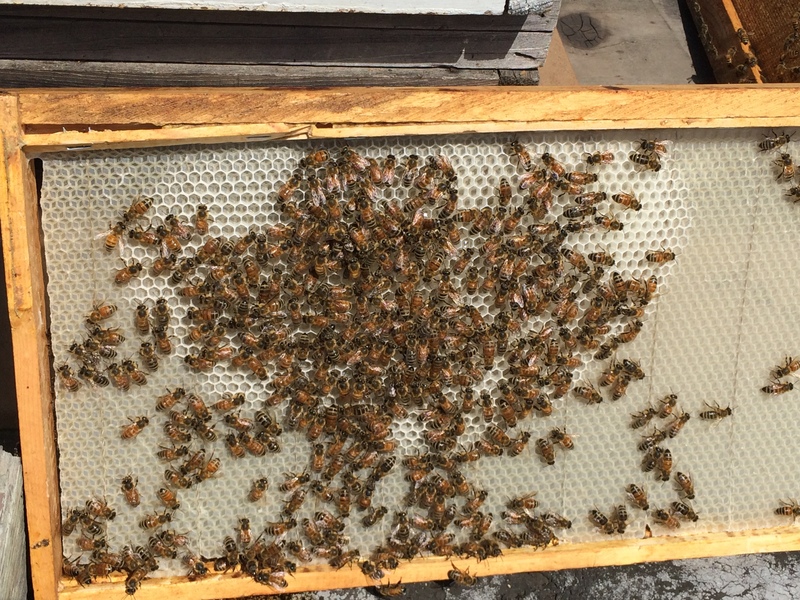 Bees in our north hive are drawing out their fourth frame of comb in a week. Well, didn’t blog in the fall because I had a book coming out, and was discouraged about the bee situation. But all four beehives have survived the winter so far, so I am going to get back to it. I feel very lucky; the hives seem strong, and still have some stores, although we have started feeding them. 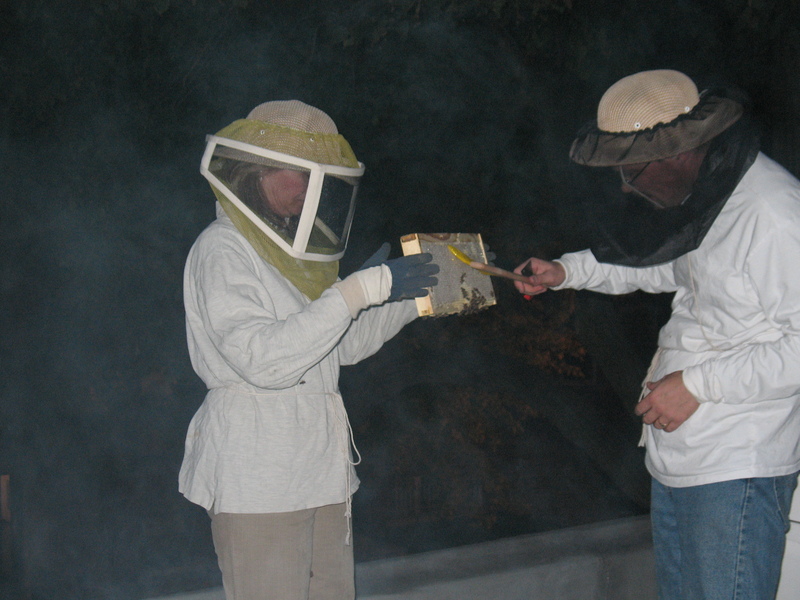 Tonight, a friend who with his wife has a summer place in Michigan said a friend of their who has 50 hives lost all of them; he described the symptoms and they match colony collapse disorder. More soon. Did a check of all four hives this afternoon, although only two thoroughly. They are all doing great. Given all the uncertainties this year, I’m happy with where they are. Will add a super on one this week, then probably on two more next week. More this evening. Quickly: installed a new queen in the queenless hive a couple weeks ago. She’s doing great. Helen has been checking a couple of the hives, I’ve been checking the newly queened one and another. They all are doing well, and the new queen–a Carniolan–is laying well. She’s still new, so I don’t want to disturb her or the bees, but each of three frames I checked before coming upon her was full of eggs and brood. More on this topic in the next couple days. Did a quick check of the two hives on the restaurant roof early this afternoon. Helen still has the smoker, so I suited up and checked them without it. Not always advisable! But although they were a little annoyed, no bees stung me. To distinguish among the hives this year, as we will soon have four, I’m going to call the ones that are on the roof now South2 and South. We have two hive stands that each hold two hives, one that my friend Joe built last year, and one that Helen’s husband Mike and others made this year. First, an update on the splitting. It was pretty simple. I made sure the two empty hives had enough frames and constructed hangers out of copper wire for the queen cages. (Queen cages that come in packages tend to have strips of metal attached, but that’s not always the case when the queens come separately.) Without something to hold a cage between two frames, it may slip down into the hive and the queen may not be released. I may have taken a few too many bees from South2, the north hive of the two, but otherwise everything went well. Today, S2 seemed busy, if less populous than South. S2’s queen took longer to get out of her cage, and so I wasn’t surprised when I saw no brood in my quick check of the hive. (it can take a while before a new queen starts laying.) But I also didn’t check all the frames. South, however, whose queen was released earlier, already has some brood going. They both are bringing in honey and pollen, and still eating sugar water. More later. Using an uncapping knife to get the wax off a frame. Just a quick note, as I have some book work to do tonight before I turn in. I did a quick check yesterday and the bees apparently got scared after I put the second super above the bee escape on Tuesday. There were still a number of bees in the supers, and they were in an odd, although evolutionarily understandable mood. They had started making queen cells, thinking not just that they were cut off from the rest of the hive, but that they suddenly were a queenless hive, I think. I didn’t see the queen, so I assume one of the workers may have started laying drone brood. I’ll know better when I check them again in a few days and they’ve capped some of it. In any case, yesterday I put the lower super back connected with the rest of the hive–there really wasn’t much capped honey in it, anyway–although above the queen excluder, and just put the full super above the bee escape. Late this afternoon, we pulled the full super and a couple frames of the other super out. And extracted! We had quite a collection of folks, including a neighborhood beekeeper, Dave, who lent us some of his extraction equipment. Also joining us were Ann, Milo, and my friend Brian, who introduced us to Helen and Mike in the first place and a number of the folks from the restaurant, as well as a few folks from Rogers Park who had heard we were going to be extracting. The best visitors were Helen’s parents, who along with Brian and Dave helped mightily with the extraction. It’s been a long time since I’ve done it, so I’m happy to report it all turned out pretty well. I’m kicking myself for not being able to take the time to put cross-wires on the super frames, because the comb worked its way out of some of the frames. But live and learn. Most of them are usable again for next year, although I will have to jerry-rig cross-wires into the salveable frames for next year, so that won’t happen again. Also later in the week, I’ll add some photos.